A woman suing her barrister daughter for libel over allegations made in a memoir of her childhood has accused her of being a "wicked thief and a liar". Carmen Briscoe-Mitchell, 74, told the High Court that Constance Briscoe - who is also a part-time judge - had forged documents for use in her defence. The mother of 11, of Southwark, south-east London, rejects the claims of routine abuse made in the book, Ugly. Ms Briscoe, 51, has defended the memoir as substantially true. Mrs Briscoe-Mitchell said the details in Ugly had "really shaken" her. Andrew Caldecott QC, representing Ms Briscoe, told Mrs Briscoe-Mitchell that she was making "very serious" allegations of forgery. She told the court: "I have to stand up for myself when you are trying to get me to admit to lies. "I will never admit to lies." Mrs Briscoe-Mitchell also told jurors that when her daughter visited London during her days at Newcastle University, she would "just run around doing shoplifting". During the hearing the 74-year-old has rejected claims that she beat her daughter with a stick, called her ugly and a "dirty little whore" and hurt her by pinching her breasts. Mr Caldecott told jurors that the allegations of forgery against his client were false and accused her mother of "saying the first thing that comes into your head". Ms Briscoe's older sister Patsy also told the court that she did not accept what was written in the memoir. "I actually couldn't believe what I was reading because it was totally untrue," she said. She said that when her sister was a little girl, she was "very assertive, bubbly, always cracking jokes and she was funny". Patsy Briscoe also told the court that an allegation that their stepfather had sexually abused her sister was just "made up". She added that the motivation for Ugly was to get back at their mother. "It's all about getting revenge on my mum for writing to the Bar and alerting them what her behaviour and her character is all about," she said." Mrs Briscoe-Mitchell is also suing the book's publisher Hodder & Stoughton. 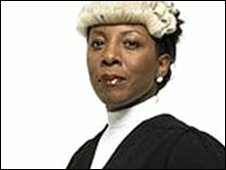 Ms Briscoe is one of Britain's first black female judges. Ugly, was published in 2006 and followed by a second volume, Beyond Ugly.